PicoQuant has a long standing successful history in designing, building and delivery of outstanding picosecond pulsed diode lasers and time-correlated single photon counting (TCSPC) and time-tagging electronics. Our modules are used all over the world for a very broad range of applications ranging from everyday quality control to high-end scientific research in laboratories of noble prize winners. The experience of nearly 20 years has given us enough confidence in the reliability and accuracy of our built-to-last modules that we are proud to introduce the unique PicoQuant 5-year limited warranty on our laser driver of the PDL series and our TCSPC and time-tagging modules. This limited warranty covers parts and labor needed to repair manufacturing defects that occur during the warranty period. It also includes the costs of shipping warranty-related repairs from PicoQuant to our customers. 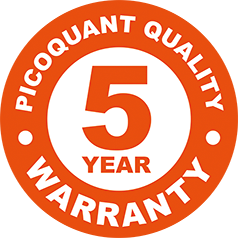 The PicoQuant limited warranty remains in effect for five years from the date of the first purchase. The PicoQuant limited warranty protects the original owner only and is nontransferable to subsequent owners. Covered items are PicoQuant laser driver of the PDL series and TCSPC and time-tagging modules, purchased from PicoQuant directly or one of its authorized resellers. A proof of purchase must be presented if this limited warranty service is required. Except as specified below, the PicoQuant limited warranty covers all PicoQuant laser driver of the PDL series purchased after June 10, 2015 and TCSPC and time-tagging modules, purchased after February 1, 2015 from defects in material and workmanship. The PicoQuant limited warranty also covers the cost of shipping out on returned items. Shipping of the item to PicoQuant is not included in the limited warranty. THIS LIMITED WARRANTY IS EXCLUSIVELY AND EXPRESSLY IN LIEU OF ALL OTHER WARRANTIES (EXCEPT TITLE), WHETHER EXPRESS OR IMPLIED, INCLUDING ANY IMPLIED WARRANTY OF MERCHANTABILITY OR FITNESS FOR PARTICULAR PURPOSE. PICOQUANT SHALL UNDER NO CIRCUMSTANCES BE LIABLE FOR ANY INCIDENTAL OR CONSEQUENTIAL DAMAGES. How to get a warranty service? If you require warranty service, please contact PicoQuant support in order to obtain a valid RMA-number. Please have the serial number and the proof of purchase ready. DO NOT RETURN PRODUCTS TO PicoQuant WITHOUT PRIOR AUTHORIZATION and without a valid RMA number.